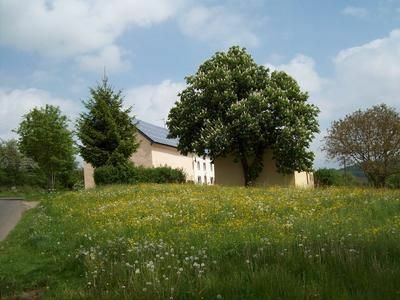 Surrounded by meadows, fields u. Forests - in the idyllic Eifeldörfchen Lierfeld - you will find the popular holiday home fine. The old farmhouse was rebuilt consuming and with great attention to detail to a modern holiday home. The perfectly equipped house is located on a large, completely fenced-in piece of equipment in a quiet location with a fantastic view and can accommodate 9 people and 2 infants on about 120 square meters. On the Grounds are 2 terraces with garden furniture, chairs, barbecue, lawn, trees, flower garden and children's playground. Storage facilities for bicycles are available. Hobby room with table tennis and football table football. Man kann dieses Ferienhaus nur weiterempfehlen !!! !